When I passed the golden age of thirty last year I got an amazing present from my family and friends, a trip to Dallas to visit the Dallas Guitar Show! Me and my friend TC took the plane over to the US the same morning as the bombs started falling over Baghdad, scary!!! Well, we manage to reach Dallas with out problems so here we where, ready to do Dallas! The day before the show we drove down to Charlys Guitars, a legendary guitar store in TX. 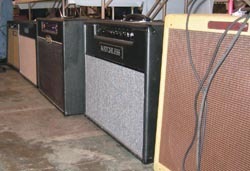 At Charlys we had the pleasure to try two DR Z amps, the MAZ38 and the Route 66. 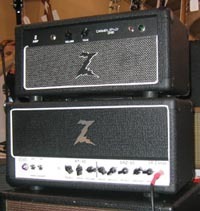 I really liked the DR Z amps, the MAZ for its "Voxish" sounding and the 66 for its Bassman honk, and they are cheap too!! 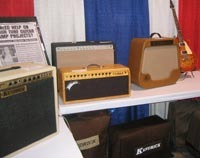 Later at the show I tested the Ghia and the new KT4555 both killer amps. The KT4555 got so many options with its design, two amps in one, could it be better? Clean tones with tons of shimmer and dynamic distortion with lots of legacy from the British giant's. US hand made of course! 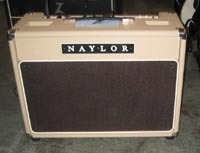 Another amp that I tested was a Naylor Combo. I don't know the name of it, but maybe some of you could tell me from the picture. It had two channels with a rich sweet tone and a really nice sustain. I also had a chat with Mr Naylor himself when he did some promotion for his Reverend Hellhound amp, another goody! If you are looking for a low price amp with the sound from a $3000 amp, this is the one, TRY IT! At the Kendrick booth I had the pleasure to hear several models, to mention a favorite I would tell you to keep an extra ear on the Deluxe amp, it really kicked! I also had the privilege to hear the famous Climax prototype, hmmm do I need to say that it sounded good? At the same show I met Harri from Custom Sounds in Finland showing his amp the Mad Professor, a VERY nice amp...more about this amp later on at UGG. At the Badcat booth James Heidrich, the President of Badcat guided me through all the new models, and to be honest, they didn't rock my boat. The one I liked the most where the Cub 2, very similar to the old Matchless Clubman in my ears. I also tested a bunch of great pedals like ZVEX (SHO, SFUZZ, SEEK WHA), Menatone (Mail Bomb, KOB) through a Carr and a Top Hat, both great amps. The Carr where more versatile then the Top Hat that sounded more like a good Twin. Later I tested the DR Z Airbrake on a Diaz Classic Twin-100, it sounded as a twin, not more or less. 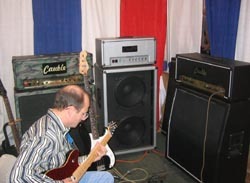 Another amp that I still got on my mind is the Cauble, a high gain monster hand build in the US by Tom Cauble. This is a serious threat to amps like Mesa Boogie rectifier and Diezel. If you are looking for heavy to the bone tones, listen to this amp before you go for the mainstream! After the show we went to Louisiana to visit Mike and Hogy at Komet Amplification. We drove an extra 200 Swedish miles through the swamps to hear the new Komet Constellation 30, and I promise you it were worth every damn meter!!!!! This amp is outstanding, with all the other amps I tested during my stay in Texas and all my other reference objects, I have never ever heard anything liked it. I found dimensions of new sounds not enough described with all the superlatives I can find, you have to experience this to understand! Since I ordered one, I promise you a full cover on this amp later on. After the euphoric stay in Baton Rouge that ended with a nice dinner with Hogy we drove to Austin to continue our hunt for amps to try out. Down in Austin we went to Fulton webb to try the new Eric Johnson model DR45. The DR45 sounded like a sweat JTM45 and you could easily dial in EJ tones. It sounded a bit to dark for my taste, but still it's a great amp! We also tested the Alessandro English Coonhound, a really nice amp from the Trainwreck School. Great overtones and sustain for hours. A really good lead amp! I tested a couple of more amps and pedals to update my reference library so I have something to lean on when we do our reviews on the UGG website. On this trip also had the pleasure to listen to many good players, most of them with out an expensive amps or tons of pedals, just a guitar and a couple of worn out fingers. I also want to give my friend TC many THANKS for guiding me all around Texas!